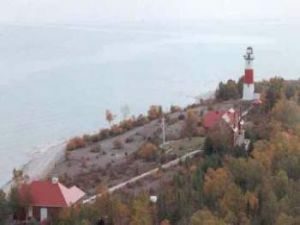 Middle Island Light Station is located in Lake Huron, halfway between Thunder Bay Island and Presque Isle. There are seven buildings on the island, including a light tower, Keepers Quarters, an Oil House, Tool Garage, a Fog Horn building and two brick privies. The conical brick tower stands 77 feet tall. The Lighthouse is white with an orange band in the middle. It's light is 78 feet above low water and can be seen for 17 miles.